Pawtucket is a Rhode Island city founded in 1671. It was home to the father of the American Industrial Revolution, Samuel Slater. The construction of his historic textile mill, called Slater Mill, marked the beginning of said revolution in 1793. Since then Pawtucket has shifted out of textiles (with only a few specialty manufacturers remaining) and has grown to hold 300 diversified industries with the most prominent being jewelry, silverware, and metals. Pawtucket houses nearly 73,000 residents with a median age of 35.4 (as of the 2000 census). It is a diverse city home to many cultures resulting in a spectrum of sights, sounds, and flavors. Its neighborhoods have all improved greatly over the last decade as the city's developmental policies focus on improving the quality of residential areas and expanding emplyoment. With an emerging interest and concentration on the arts, Pawtucket has introduced performing arts as well as incorporated visual arts into the community. T.F. Green Airport (PVD) is about a 20 minute drive from Pawtucket. PVD is a national airport with connecting international flights. Logan International Airport (BOS) is an hour away located in Boston, Massachusetts and is an international airport. RIPTA bus Route 99, from Kennedy Plaza in Providence, converts into Route 76 which goes to Central Avenue and Newport Avenue. It also converts to Route 71 to Broad Street. Route 95 runs right through Pawtucket. Exit 29 (from 95N) will bring you to Central Avenue, from which you can easily get downtown. The Providence/Stoughton Rail line runs through Pawtucket. The closest passenger train stop is the one in downtown Providence, about a 10 minute drive from Pawtucket. RIPTA lines run everyday all throughout the city. The easiest way to get around Downtown Pawtucket is by bus, since traffic tends to make driving very frustrating. Schedules can be found online at the official RIPTA website. If driving is your preferred means of transportation, traffic or not, beware of the one ways around the RIPTA Station and the Pawtucket Public Library. Downtown Pawtucket has received federal recognition for its contributions to community planning, industry and architecture. The Historic District has been added to the National Register of Historic Places by the National Park Service. "Pawtucket Carnival"" is held twice a year in July and August. The location of the carnival varies depending on the month but it is usually in front of The Pawtucket city Hall. The carnival is great for kids very expensive but kids will definitely enjoy all the fun rides and snacks. Bristol only a forty minute drive from Pawtucket is home to the historic 4th of July parade and beautiful scenery, especially Colt State Park, a must see. Newport, fifty minutes to the south of Pawtucket,is home to famous beaches, streets and Mansions. Open seasonally the Newport Mansions are an affordable family friendly attraction. 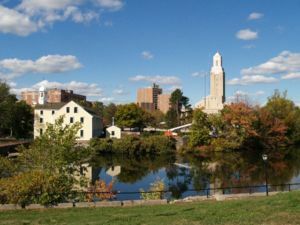 Providence, just ten minutes away from downtown Pawtucket, Providence is the Rhode Island epicenter for politics, shopping and beauty. Cultural draw is Thayer Street. This page was last edited on 30 March 2016, at 07:50.